hot in the mornings when the girls want to be outside playing. But more on the making later. have corners, I mean) legs, so it got picked instead. No complaints - I love anything round. recent garage sale- a two-toned pink twill comforter for $2. would only be good in supporting roles. 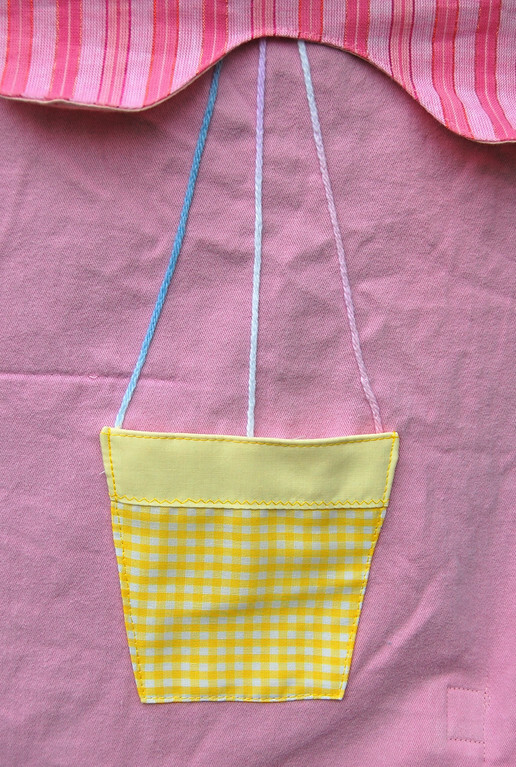 of the yellow sheet and some scrap gingham. to the inner wall with velcro. with more of the same yellow curtains and velcro tie-backs. Ah, but you all probably want to know about that there roof. ribbon tentacle-streamers to give it a little weight. So yes, to answer your question, the roof is a dud. The interior of the tent is only as high as the table top. That seemed to me an awful waste of space just for aesthetics. the girls could invite their dollies to a party in the attic. for budding gardeners to plant felt flowers in. but a round table allows for equal-length dowel spines. 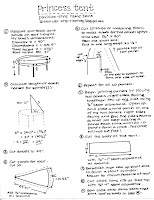 Sorry if it looks like a Math worksheet. There's Physics in there, too (yay)! I used 1/4" dowels from craft stores. They were about 60 cents a piece (regular price) and were a standard 36" long. I cut them down to 29" for this project. 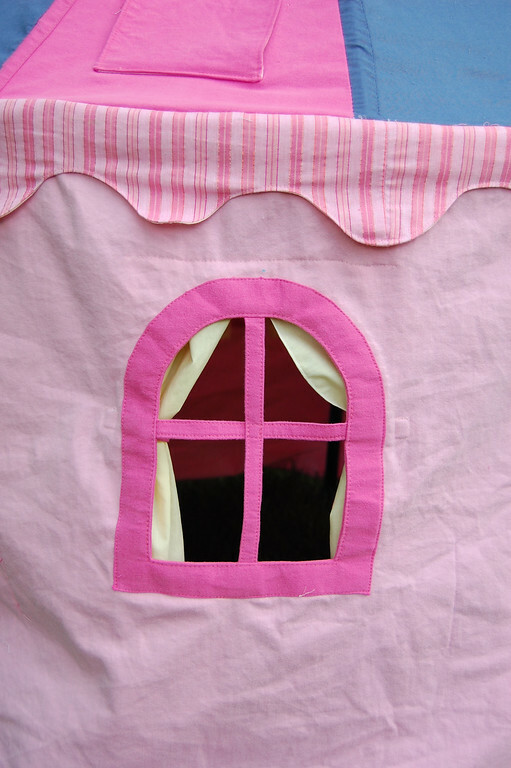 I used craft-weight fusible interfacing for the frames and cross-bars of the windows. Twill or drill is a good weight material to use. Typical bedsheets are too thin. Embellish before you sew the main pieces together. Otherwise there is a lot of fabric to handle around the sewing machine. This whole project cost about $20, I'm estimating. While measuring the table for this, I noticed that the tabletop was screwed on to the circular metal frame. That made me wonder if it might also be unscrewed and removed, leaving only the empty frame and legs. This might allow a person access to the space under the roof. But I decided against it because I suspect (but did not test out) that the circular piece of fabric holding the two halves together provides some useful supporting tension. There's a good chance that I'm wrong so if anyone successfully makes this sans tabletop, tell me, tell me! Melissa at Day to Day. Jamie at Nothing Fancy, who also did a follow-up post on Tips for Making a Table Tent when she made a matching one for her little girls out of a piano bench! some lovely playhouses on etsy here. please let me know - I'd love to see how it turns out! Thought of more variations on the round table shape. and windows and pretend it's full of grain. play Faraway Tree (sigh........) all day. birthday cake and use it as a birthday party prop! beside it for thank-you notes! Must stop now. Must stop now. Must stop now. Must find chocolate. Breathe. Breathe. Breathe. Round tents = endless possibilities. a mailbox-with-slot, along with interior embellishments. since it will be hers, Jenna's and Kate's, so she's very excited. come back to the bags eventually, I promise! unconsciousness) and knew I had to change it. be months before it will get done! Ha ha ha!" reuploaded the corrected instructions now, so all is well. try to and had to drink heavily after. It wasn't you - it was me. 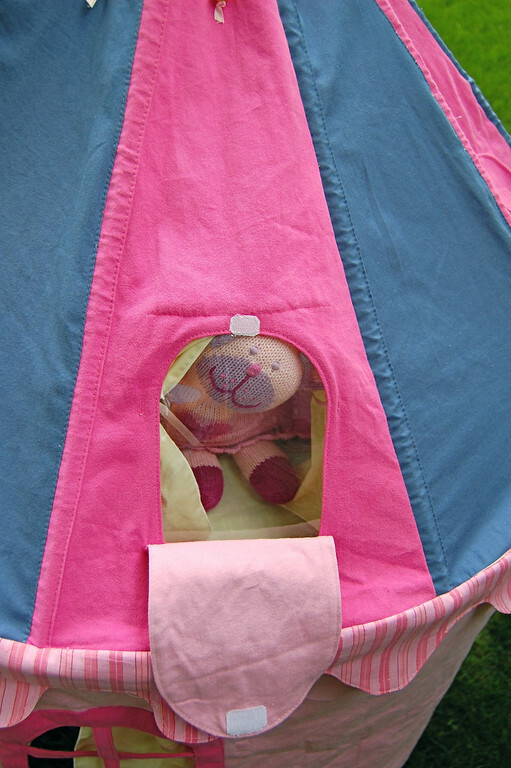 That is an insanely cute tent and you are so clever! How do you find the time to do so many things? i only have 1 child and can barely finish cutting out a pattern in one day. That said, it'a a LOVELY tent. I want one.
. . . It's just possible that you are the Coolest Mom Ever. 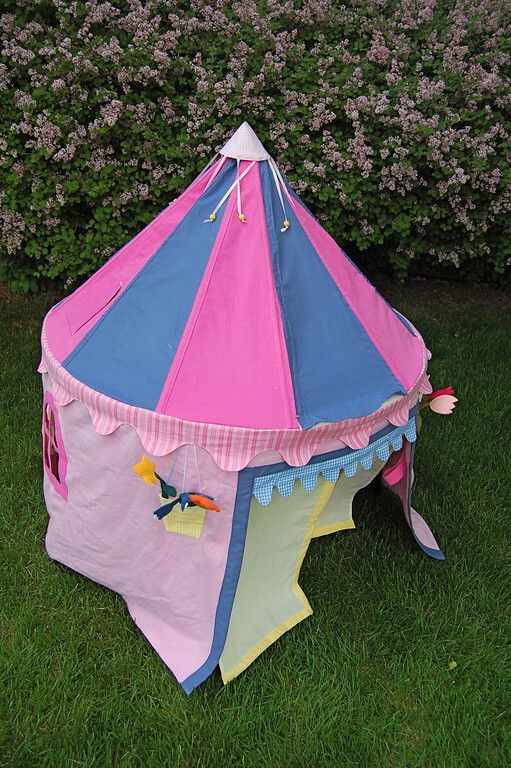 that's FABULOUS -- perfect princess tent! Your gals are so lucky ! The tent is fabulous ! Fabulous. I turned out so so cute. The gingham curtains, that each tie back no less, the hanging basket for flowers, it's all so so lovely. And I LOVE that you added the peaked roof. Hadn't seen that before. 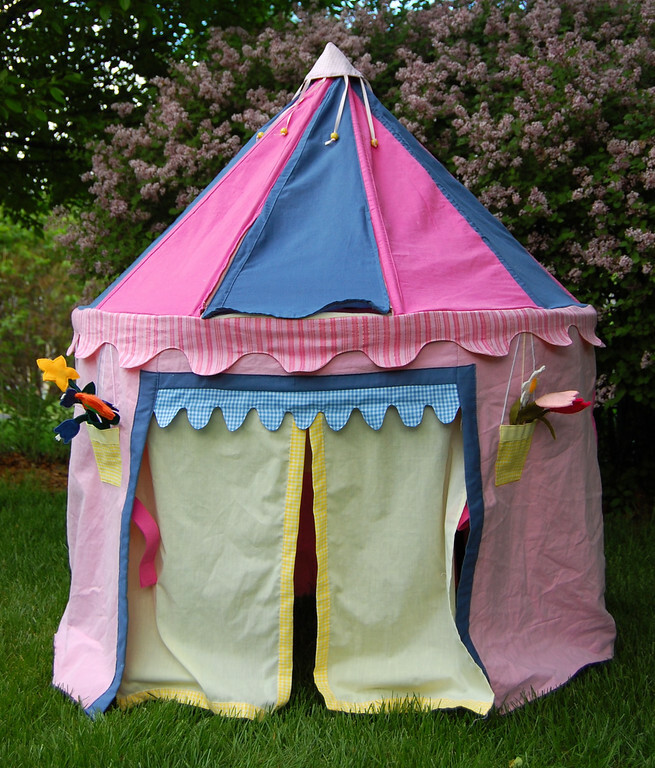 And then that you made it a useable space -- an attic for dollies -- well, that's fantastic. Oh that is amazing work! My little guy is too small to appreciate but I will make him one. Great job, thanks for sharing! OMG-luckiest kids ever. That is so awesome. I'm an adult and I want it-haha. LIER! Oh. My. God. Oh. My God. I am speechless. Outstanding. I am stupefied. You have stupefied me. This is so cute! I love all the details you've worked into it. 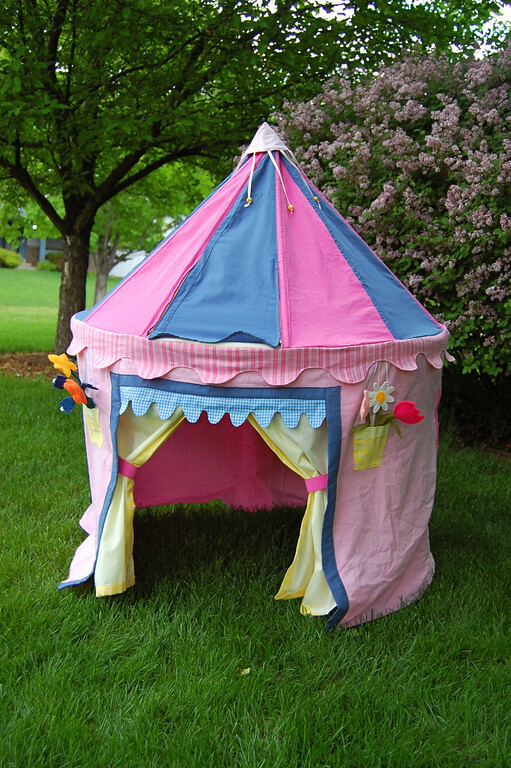 I keep thinking of making a table tent for my kids, but I doubt it'll be anything this elaborate. This is amazing! OMG this is one of the cutest things I have seen on a blog! Wow! Holy Smokes!!!! I'm ready to go out and get pregnant for a girl (I have 3 boys) this thing is so DARN cute. You are amazing. I'd love to see someone make the rocket ship so I can steal it. Your tent is fantastic! I have a boy, so this wouldn't work for us, but I am thinking about some original idea. Maybe a barn for a square table. 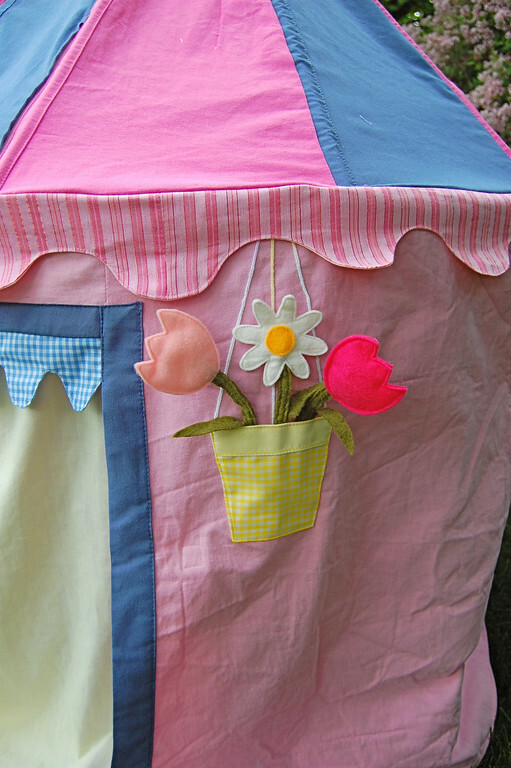 I have so much on my table (no pun intended), I may have to settle for using the camping tent outside for my toddler. I adore your garden, too. I SO want to make that, too. You are awesome. Uff-da. That's all I can say. Hello all! Thank you for the lovely comments. Can someone try the rocketship one, pleeeeeaase? Just so I can see what it looks like? But seriously, these are not hard to make. It took me about 2 weeks of toddler-time (i.e. about 1.5 hours a day while smalls napped). A roofless one could be done in even less time, well within a week. Hunting for the cheap sheets took longer than the actual sewing! 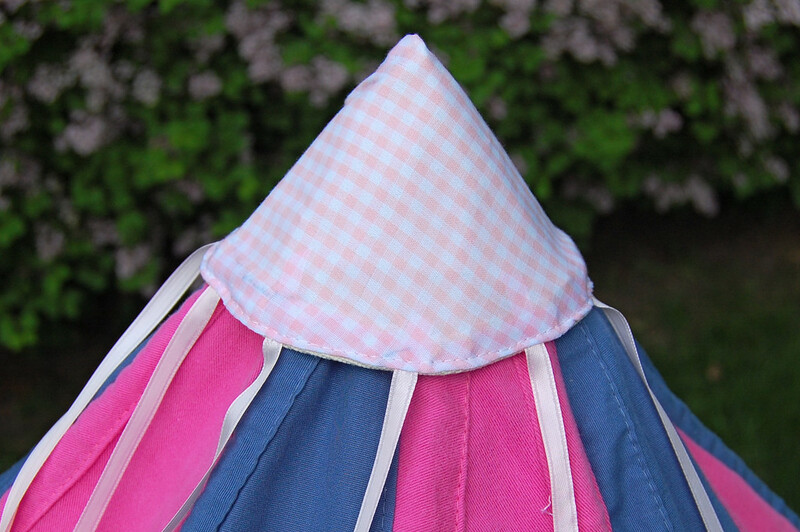 Thought of another round tent idea today - a birthday cake! Yikes! I'll have to go and edit the post and add that in. Then I must go sit down somewhere in the shade with a cool drink and breathe. Breathe. Breathe. And let the moment of insanity pass. 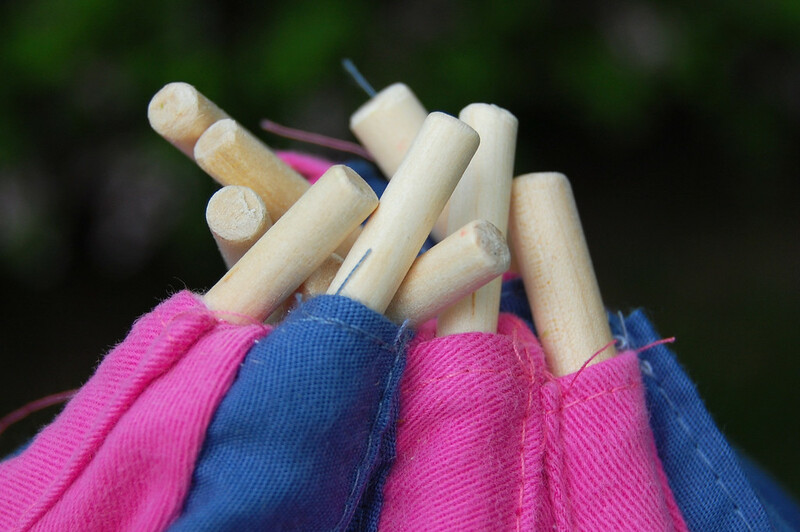 its been awhile since this was posted so you may have already thought of using a hula hoop sewn in, as long as the dowels are also sewn in and rest at the hula hoop, and you could also use dowels sewn in as the legs...I think it would work! you should try it and let us know...hahaha. thanks for your site I love it! You are such a creative rockstar, I almost can't stand it. Just amazing. I'll be linking to this. lier, yet ANOTHER amazing creation! seriously, you are one exceptionally talented mama. This is truly amazing. :-)One day your girls will look back and see how you spent your "free alone time" doing something so amazing for THEM. Good job! This is the coolest tent ever! I so wish I had one of these when I was a kid. 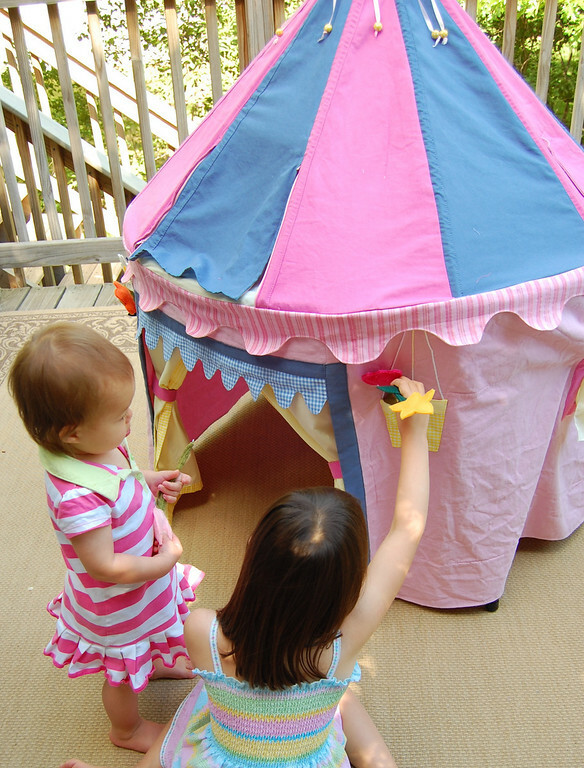 Mostly, though, at the deep, gorgeous memories these girls will have of their childhood moments here in this tent... and any other gorgeous treasures you make (and have made) for them. Takes my breath away. Thanks for sharing!!!! That is amazing and I'm sure it will be kept for years and pulled out for their kids. You smarty pants! This is beautiful! (One of the cutest things I have ever seen!) Thank you for sharing it! This is awesome! I am adding this to my list of things to make! wow! What an incredible tent!!! amazing job. When I saw your cute rocket ship sketch, I did consider how fun it would be to make one (esp. since I don't think I'll convince husband to let me build a Filth Wizard cardboard one). Then saw your recent comment above. I even have the material -- miles and miles of heather grey knit. Only problem - my card table is square... And who's ever seen a square rocket ship?!? Oh, but first MUST whack some more projects off "the list"! absolutely darling!! i've never seen a round card table, but i am certainly jealous. this puts my very square card table tent to shame. saw the picture of yours and thought, "oh, cute!" and then i saw all your details. wow. astounding. thanks for visiting my blog. i don't know how you have the time for all your fabulous creations, but i do hope you find a minute or two to make some cute dolly clothes for your girls! So so lovely! I'm really impressed! 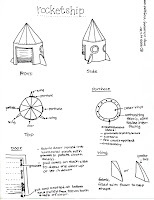 I do love the idea of making a rocket ship, especially as the monumental cardboard one we made bit the dust yesterday after over three months of constant abuse, but there are plans afoot for a wigwam/teepee currently, so it'll have to wait until the space exploration vibe strikes again. I love love love seeing the things you make! Ok! I am blown away! You are too awesome for words with this project! Not only did you make it but you included instructions. I wrote a post on my blog about this because I just think it's wonderful. This is very, very cool. Ok, so you've heard that 41 times before now, but it's worth repeating. I have used your photo for my own blog (mostly) Handmade Holiday and given you full credit and links so that people can find the directions on your site. If you'd like anything added or changed to my post, please let me know! This is truly amazing! 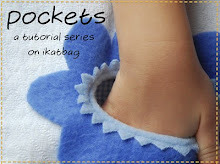 It is going on my must-do queue...am thinking my 3 boys would flip for the rocket ship! Thank you for sharing! Fabulous! Now, I need one just a wee bit taller for me to escape in! Oh my goodness, this is a work of art. How much love and thought must have gone into this, your children are so lucky to have such a talented mama! So cute. You really went all out, I love it, and the Rocketship idea is awesome for boys! You are amazing. 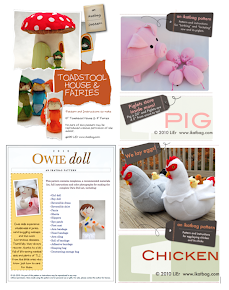 Hello, i referred your creations on my blog. You can see them on Playhouse ovvero le casette gioco . That is AWESOME! I would've loved to have had one of those when I was a little girl. Great job! Oh my gosh, this is gorgeous! I must make it! But maybe after the 17-month-old twins grow up! I love this!!! So cute, you did an outstanding job! I LOVE it! I don't think this particular design would work at my house though because I can see my girls joining their dollies in the "attic"...and knocking the whole thing down... But it is so cute and I would LOVE to make that!!!! HOW AWESOME!!!! I bet the girls LOVE this all the way! have to see what i can do with the idea for my girls!!!! This is surely one of the sweetest things I have ever seen for a girl! 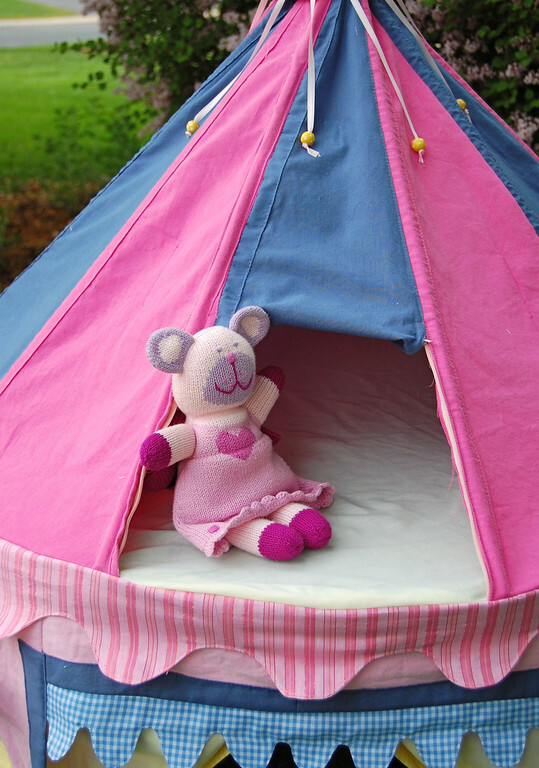 Never mind the song I'd Like To Teach The World To Sing ~ it should be I'd Like To Make My Girls a Tent!! wow a true inspiration, simply beautifull!!!!!! Holy Freaking Guacamole! That.is.simply.awesome!! I'm currently bowing to you. Great tent! On my list of "to-do's" but I don't know if I'll ever tackle it. I just posted my fiasco following the directions off of another site. But, I think I would attempt yours for a change of pace from rectangular to round! That looks fabulous!!!!!!! Great idea to give the dolls some "Attic Space" :) hehe. I bet your kids were THRILLED!! This is amazing. I absolutely love this! This is fabulous and wonderful! I'm totally inspired to make one for us! Found you on Pinterest and am pinning again! Thank you! Just wanted to tell you how awesome and creative this is. I love the princess one and hope to one day create the rocketship for my boys. I also love all the other ideas you came up with (mushroom, cupcake etc). Fabulous and awesome! Thank you! WOW! This is awesome!!! I am so glad I found it - I thought there is no way I could make something like that, until I read that it is a"glorified tablecloth". Now, I'm totally excited to do it!! I have just the table - a card table that has been sitting in our storage area for months, maybe years. I can't wait to give it new purpose. Wow, you have done an amazing job! Lucky girls. YOU are very creative and brave, my dear! 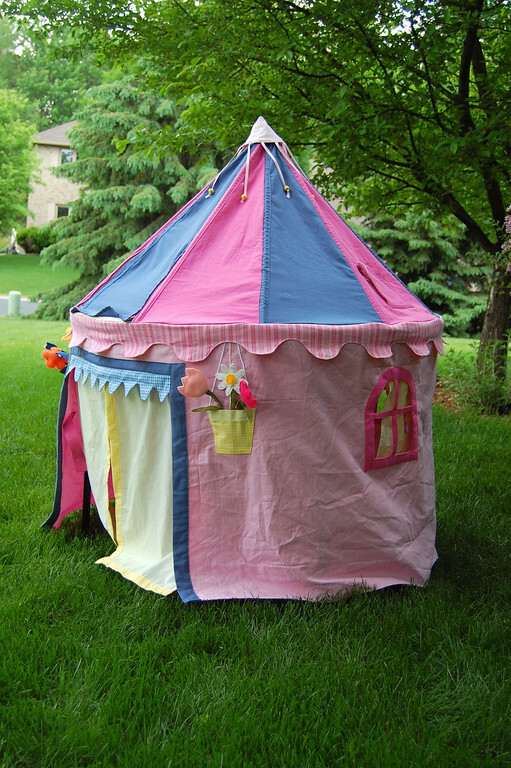 Totally enjoyed reading this post and although I will not be attempting a Princess tent, (as my daughter is all grown now! ), I am using your pattern for the ballet slippers! I am making several very small pair for my Christmas tree this year. So THANK YOU! For being so creative and generous, sharing your patterns, but most of all? For being such a good Mommy. Your most wonderful creations will go forth in this world to make it a better place. Much like their Mother before them! This is great !!! 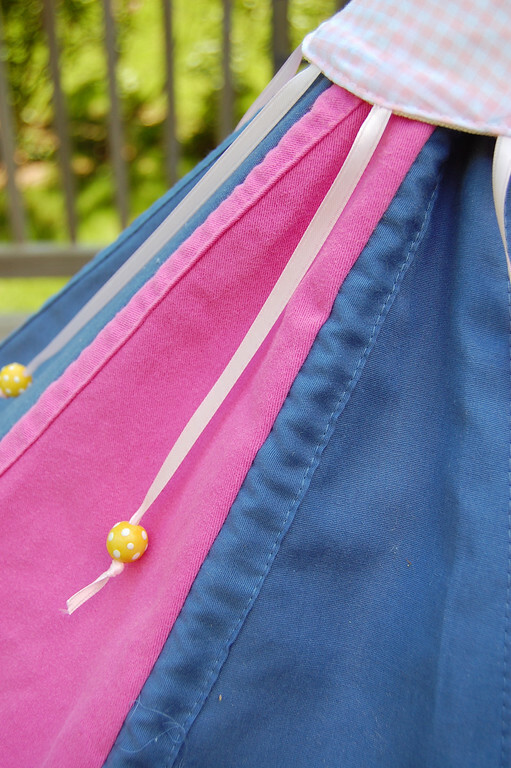 I been looking at the tepees on Etsy and can't bring myself to spending so much ! Even though I know these ladies have put so much time into making them. This is perfect and I have plenty of these "card" tables setting around. I can't wait to get started. Thanks for sharing !! 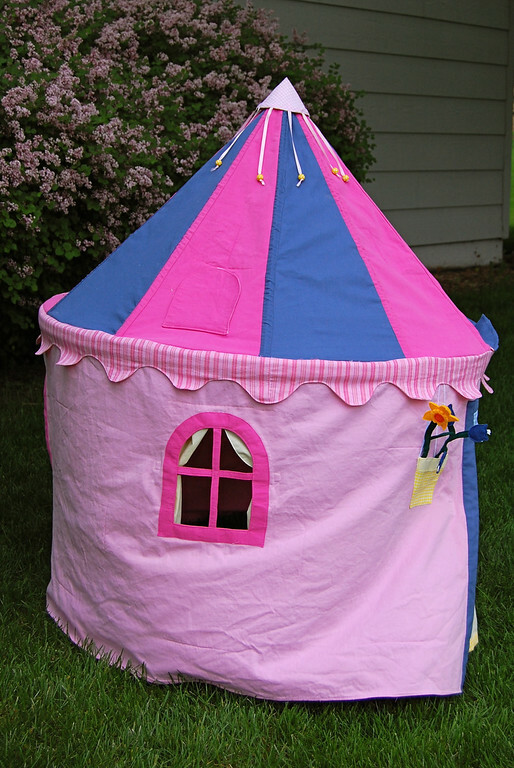 I commented a little while ago about the fabulous Table Princess Play house. I went and reread the entire post and had to laugh. It's so nice to know some one else's brain works exactly like mine does and also who's brain is so evil to know your always too busy to go back and correct every thing. After all it's not our fault that we use the incorrect wording because our brain knows exactly what we are meaning to say LOL. Love it !! So glad I came across your blog the laughs alone are wonderful ! !